I’m Pete Schofield, Chief Information Officer for Corporate Services in HMRC. 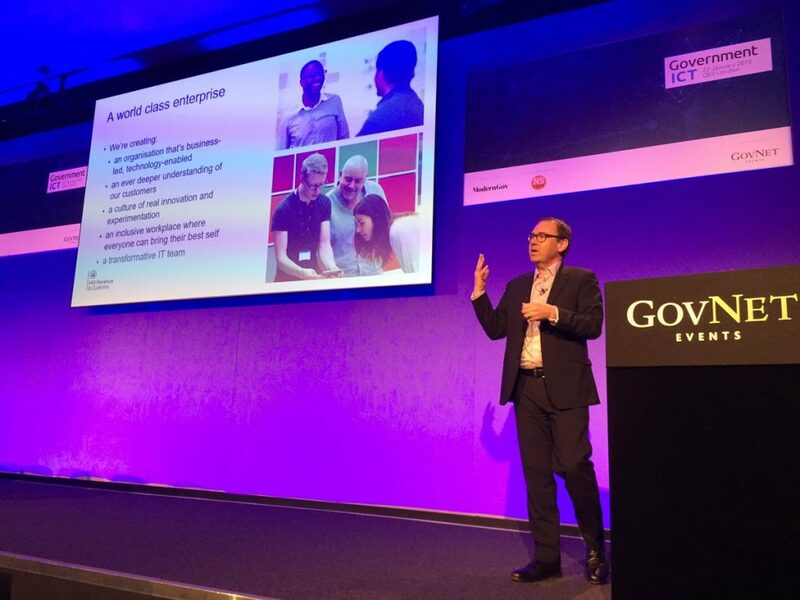 I recently went to the Government ICT conference where I was asked to speak for 15 minutes about HMRC being a transformative organisation - no mean feat considering everything we’re doing! I went for a synopsis of our main activities so I thought I’d share it with you. We are here to bring in the money to fund UK plc, there would be no public services if we didn’t. It’s obvious really but often many people just simply forget this – we don’t. Last year we collected £605.8bn and each year we bring in more and more for the nation, handling 2bn+ transactions and serving around 50 million customers. These are the responsibilities of HMRC as a whole, not HMRC digital alone, though the work we are doing has a huge bearing on HMRC meeting its’ objectives. We are creating an organisation that’s business-led and technology enabled. We’re using technology to get an ever deeper understanding of our customers with insight analysis and joining up some of our data. We have loads to learn but we have started. 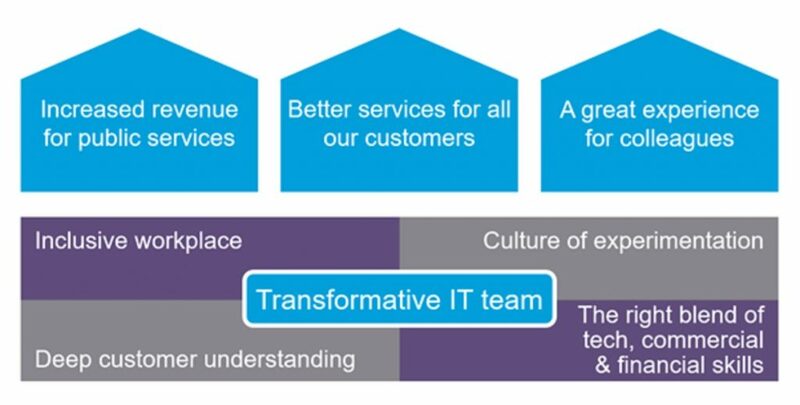 We are beginning to encourage a culture of real innovation and experimentation and with an inclusive workplace where everyone can bring their best self, we are creating a truly transformative IT team. With so many projects underway I picked out just some of the key results we all achieved from the last year. Understanding our customers is at the heart of everything we do. Our customers are both our starting and end point. So we’re building a real data culture, using insights to make services easier to use, more intuitive and accessible and more cost effective. I’d just like to say that in the last two weeks so many people have asked me ‘what have you done to the online self-assessment, it is so easy and has taken me only 10-15 minutes to complete’. This is HMRC and Digital understanding the customer and their journey at its best! We’re using a DevOps approach in all our work. This helps us to implement quickly, fail fast and learn fast. To fill any skills gaps we run a range of talent schemes for existing and new colleagues as well as recruit apprentices and industrial placement students. Working with partner organisations has a great side effect, by bringing real innovations and experience directly into our teams. We think we have seen between 20-40% quicker delivery in some of our projects working this way, awesome! We remain mindful that all our colleagues and customers have very different needs so we make sure we are building services for all. We have accessible collaboration tools for our people. For our customers we build accessible software and user journeys. We’re harnessing the move towards voice-activated home devices and our use of AI offers many possibilities like document and text recognition. I told everyone we firmly believe that our services are for all of our customers so why wouldn’t our technology be for everyone as well, no matter how able they are. It’s obvious when you think of it like this. I had some great questions with people really interested to hear more about our accessibility for all, our agile ways of working and our ability to try things, fail, learn and then try again. So there it is, a short, sharp summary of my chance to speak at Government ICT recently. I’d love to know what you think, drop me a comment below. Follow us on Twitter @HMRCdigital. Make sure you don't miss any of our blog posts, sign up for email alerts.